Monster Cookie Bars - Hi, friend Popular Recipes, in this article entitled Monster Cookie Bars, we have prepared this article well and concise to be easy to understand for you to read and can be taken inside information. hopefully the contents of the post Article baking, Article bars, Article Cookies, Article food, Article M&Ms, Article oats, Article peanut butter, Article recipe, that we write this you can understand and useful. okay, happy reading. Stephen and I just returned from a nice little vacation in California. While we were there my brother brought us a bag of gluten free monster cookies from a local bakery. I was surprised to find out that both my mom and Stephen had never tried monster cookies. As a peanut butter, oatmeal and M&M lover, I had just assumed that everyone had tasted this delicious combination. I was wrong. I made it my goal to bake up some kind of "monster treat" when we came back home. My first thought was to do my own gluten free cookie version but since I was short on time and didn't have the necessary ingredients, I turned to bars. 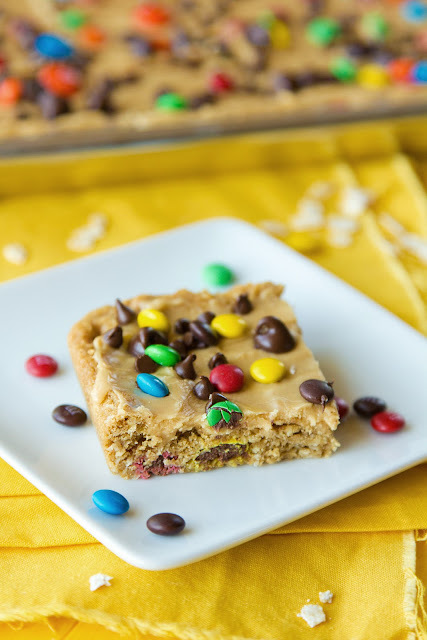 Let me start off by warning you: these are not your typical monster cookie bars. Mine are ultra moist and topped with a creamy peanut butter spread that really puts them over the top! If you like your bars extra gooey, go ahead and stick to 15 minutes of baking time, they'll be even more soft and chewy! I took these to a picnic dinner and they were a huge hit- I hope you'll think so too! 1. Preheat oven to 350 degrees. Lightly grease (or cover with parchment) a full size cookie sheet with sides. 2. In a medium size mixing bowl, whisk together oats, flour, baking soda and salt. Set aside. 3. In the bowl of a stand mixer, beat together peanut butter, butter and sugars for 1 minute. Turn speed to low and add one egg at a time. Add vanilla and mix until combined. 4. Remove bowl from stand mixer. Fold in dry ingredients, then chopped peanuts, chocolate chips and M&Ms. Pour onto prepared pan and pat down until even. I like to use a my hands to get it all spread out, and then a spatula to make it smooth and even. Place in oven and bake for 15-18 minutes, or until the top begins to brown. 5. While the bars are baking, in a medium size mixing bowl, combine all of the topping ingredients. Using a hand mixer, beat until smooth (it should be a spreadable consistency, but will it will also melt and get shiny on contact). Set aside until needed. 6. Remove bars from oven and place pan on a wire rack. Allow to cool for 8 minutes before spreading the peanut butter topping over the entire sheet. It should become smooth and melty, spread until even. Sprinkle remaining chocolate chips and M&Ms over top, allow to cool for 30-40 more minutes before cutting into bars. Thank You and Good article Monster Cookie Bars this time, hopefully can benefit for you all. see you in other article postings.